Typically sold alongside baozi inside stacks of steaming bamboo baskets, shāomai (Chinese: 烧麦) are wonton-skins wrapped around savory glutinous rice with its skin gathered at the top. 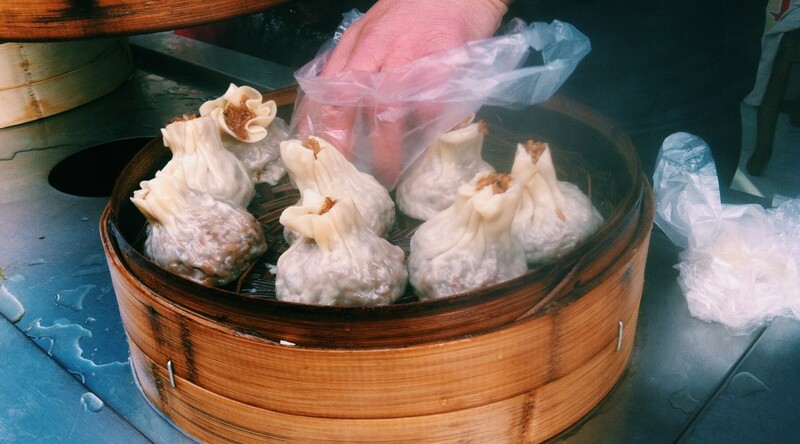 The street food is typically eaten as a hand-held breakfast staple and sold for 1.5 yuan. It is a popular street food snack that has been gradually introduced to provinces throughout China, where it has adapted to different regional tastes that have changed its ingredients and forms in various ways. In the southern provinces of Zhejiang, Guangdong, and Jiansu, the radical “mai” in shaomai means to sell, while in Northern provinces of Beijing and Inner Mongolia, the radical “mai” in shaomai means wheat. Regardless of the region’s form of Chinese character, Chinese people know shaomai as a type of dumpling made with flour that is made with baking powder and with a skin that gathers at the top to resemble a pomegranate. Shaomai consists of glutinous rice balls seasoned with scallions, minced pork, mushrooms, soy sauce, and salt. They are wrapped around thin wonton skins. Ground pork is seasoned with salt and minced scallions and pan-fried. Shiitake mushrooms are minced and slightly cooked. Glutinous rice (nuomi) is first steamed and then combined with the ground pork, mushrooms, and soy sauce until the rice is dyed a light brown color. The seasoned rice is wrapped around a thin wonton skin and cooked in a bamboo steamer for 5 minutes. They are left in the steamer to stay warm, and served directly from it. The earliest historical record of shaomai dates back to the 14th century during the late Yuan Dynasty and early Ming Dynasty in a Korean-Chinese textbook called “Pu Tong Yan Jie”, which mentions the street food. It is said that the name comes from having a similar appearanceto taohua, which means peach blossom. During the Qian Long periodof the Qing Dynasty, it also appeared in a line of a poem that stated, “Shao mai huntun lie man pan,” which describes how people ate shaomai alongside dumplings on a plate. Several different fillings are described in the Qingping Shangtang, including vegetable, lamb, chicken, pheasant, sesame, plum, and lamb. While there are various textual recordings of the street food’s existence, its geographical origins are traced to the Inner Mongolia province, where Qing Dynasty merchants would visit tea houses where they were served and bring them along with them as they traveled throughout the surrounding areas.